The LS7082N is a CMOS quadrature clock converter. 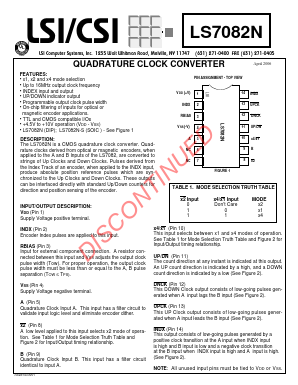 Quadrature clocks derived from optical or magnetic encoders, when applied to the A and B Inputs of the LS7082, are converted to strings of Up Clocks and Down Clocks. Pulses derived from the Index Track of an encoder, when applied to the INDX input, produce absolute position reference pulses which are synchronized to the Up Clocks and Down Clocks. These outputs can be interfaced directly with standard Up/Down counters for direction and position sensing of the encoder. • On-chip filtering of inputs for optical or magnetic encoder applications.